Gustavus Adolphus College ( /ɡəˌstävəs əˈdôlfəs/, Gus-TAY-Vus ) is a private, coeducational, liberal arts college in the town of St. Peter, Minnesota, United States. A four-year, residential institution, Gustavus Adolphus College was founded in 1862 by Swedish Americans and is affiliated with the Evangelical Lutheran Church in America. To this day the school is firmly rooted in its Swedish and Lutheran heritage. The premier event on campus is the annual Nobel Conference, which features Nobel Laureates and other world-renowned scholars explaining their expertise to a general audience. The college has 170 faculty of which 94% are tenure-track faculty. The student to faculty ratio is 11:1 creating class size of approximately 15. The college is guided by five core values: community, excellence, faith, justice, and service. Students are encouraged to become involved in volunteer work, and service learning is integrated into many of the courses on campus. The college was founded in 1862 as a Lutheran parochial school at Red Wing by Eric Norelius. Originally named Minnesota Elementarskola (elementary school in Swedish), it moved the following year to East Union, an unincorporated town in Dahlgren Township. 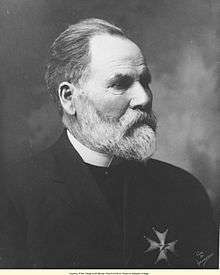 In 1865, on the 1,000th anniversary of the death of St. Ansgar, known as the "Apostle of the North", the institution was renamed and incorporated as St. Ansgar's Academy. In April 1873, the college was renamed Gustavus Adolphus Literary & Theological Institute in honor of King Gustavus Adolphus of Sweden. On October 16, 1876, it opened as Gustavus Adolphus College at the current location, enticed to relocate to St. Peter by the town's offer of $10,000 and a large campus. Gustavus is the oldest of several Lutheran colleges in Minnesota. It was founded as a college of the Augustana Evangelical Lutheran Church. In 1962 it became a college of the Lutheran Church in America, when the Augustana Synod merged into that body. The Lutheran Church in America merged in 1988 to create the Evangelical Lutheran Church in America. During World War II, Gustavus Adolphus College was one of 131 colleges and universities nationally that took part in the V-12 Navy College Training Program which offered students a path to a Navy commission. The annual Nobel Conference was established in the mid-1960s when college officials asked the Nobel Foundation for permission to name the new science building the Alfred Nobel Hall of Science as a memorial to the Swedish inventor, Alfred Nobel. Permission was granted, and the facility's dedication ceremony in 1963 included officials from the Nobel Foundation and 26 Nobel Laureates. Following the 1963 Nobel Prize ceremonies in Stockholm, college representatives met with Nobel Foundation officials, asking them to endorse an annual science conference at the College and to allow use of the Nobel name to establish credibility and high standards. At the urging of several prominent Nobel laureates, the foundation granted the request, and the first conference was held at the college in January 1965. Gustavus Adolphus College is currently ranked among the best 100 national liberal arts colleges by U.S. News & World Report. In 2014, Gustavus ranked 76th rising from 85th in the 2013 rankings. Gustavus is also the 40th for "Best Value". In 2016, Gustavus Adolphus ranked 74th of 705 colleges in MONEY magazine. The magazine's rankings determine which of the roughly 2,000 four-year U.S. colleges and universities deliver the most value—that is, a great education, at an affordable price, that prepares students for rewarding careers. The remaining 705 colleges are ranked on 24 factors in three categories: educational quality, affordability, and alumni success. The college also ranked 23rd on the magazine’s list of the 50 Best Liberal Arts Colleges. The 2015 edition of the Washington Monthly college rankings, Gustavus ranked 55th among liberal arts colleges. Washington Monthly assesses the quality of schools based on social mobility (recruiting and graduating low-income students), research (producing cutting-edge scholarship and PhDs), and service (encouraging students to give something back to their country). Students choose from over 70 programs of study with 75 majors in 24 academic departments and three interdisciplinary programs (including 14 honors majors), ranging from physics to religion to Scandinavian studies. The College's Writing Across the Curriculum program fosters writing skills in all academic disciplines. Since 1983, the college has had a chapter of the academic honor society Phi Beta Kappa. The school offers an alternative interdisciplinary general education program known as the Three Crowns Curriculum. Recently the college instituted a test-optional admission policy, making it the first private college in Minnesota to forgo the ACT/SAT score requirement on its application. Since its founding, Gustavus Adolphus College has produced various Fulbright, Goldwater, Marshall, Rhodes, Truman, National Science Foundation, and NCAA Postgraduate fellowship winners and scholars. The college's first building in St. Peter, affectionately known as "Old Main," originally housed the entire college. The campus, known as "The Hill", is situated on 340 landscaped acres and features science facilities, computer and language labs, and a large, new dining facility. The campus includes 33 sculptures by the late Minnesota sculptor, Paul Granlund, an alumnus of the college who for many years was sculptor-in-residence. Every tree indigenous to Minnesota is grown in the college's Linnaeus Arboretum. In 2009 students founded Big Hill Farm, which grows produce for the cafeteria and aims to connect the campus to sustainable agriculture. In the Fall of 2011, a new social science center, Beck Hall, was opened on campus. 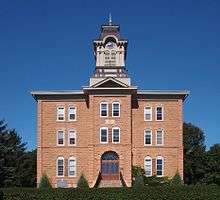 “Old Main” was the first building erected at Gustavus Adolphus College when its cornerstone was laid on August 12, 1875. Contracted to O. N. Ostrom and constructed from Kasota limestone, the total cost of the building was around $25,000. Old Main was completed in 1876 and dedicated on October 31 of that year. Originally referred to as the “School Building,” as more buildings were erected, it became known as the “Main Building” and by 1905, it became commonly referred to as "Old Main." The building was heated by wood stoves and housed the entire college in the first years of the institution before other buildings were added. It originally contained several classrooms, sleeping quarters for students, faculty, and the president as well as a kitchen, dining room, chapel, library, and museum. Until 1920, it was tradition for seniors to gather on the building’s roof for a sunrise breakfast the morning of commencement. On its 50th anniversary in 1926, Old Main underwent a renovation from funds provided by the Minnesota Conference. The 1998 tornado, which destroyed much of the Gustavus campus, resulted in the need to repair Old Main’s bell tower. Seven years later in 2005 another renovation was completed; the building now houses the Office of the Chaplains and the religion, political science, philosophy, and classics departments. A popular ghost story surrounding Old Main is the tale told by former Chaplain Richard Elvee of two deceased Gustavus security officers, Harley and Barney, occasionally wandering its halls while he composed his sermons on Sunday mornings. Christ Chapel is a church located in the center of Gustavus Adolphus College. Constructed from March 2, 1959 to fall 1961, the chapel was dedicated on January 7, 1962. Construction of the chapel was made possible by gifts from the congregations of the Lutheran Augustana Synod, a predecessor body of the Evangelical Lutheran Church in America, which is affiliated with the college. Ecumenical services are held each weekday and on Sundays during the academic year. There is seating for 1,500 people in the chapel, with 1,200 on the main floor and an additional 300 in the balcony. It is the largest seating area on campus. The chapel and surrounding grounds are adorned by the sculptures of Paul T. Granlund, the former artist-in-residence at Gustavus Adolphus College. The organ in Christ Chapel was originally built by Hillgreen-Lane at the time the Chapel was built. It has been significantly altered in the last 30 years. These renovations, carried out by David Engen and more recently by the Hendrickson Organ Company of St. Peter, include a new console with solid state combination and relay, moving several ranks of pipes from an antiphonal position in the basement into the main organ above the balcony, restructuring the Swell mixture, and extensive repairs following the tornado of 1998. It currently contains 55 speaking ranks of pipes, played from a four-manual console, and has a preparation on the new Great chest for a mounted Kornet V stop. The Chapel also houses a small portative organ of three stops on one manual which is used for accompanying and especially for continuo playing in Baroque compositions. On March 29, 1998, the spire, which towers above the chapel, was toppled by a tornado that left most of St. Peter, Minnesota in ruins. On March 17, 2008, the cross that was atop the spire was hung from the ceiling in Christ Chapel during a service marking the 10-year anniversary of the tornado. On January 8, 1970, the Auditorium was completely gutted by a fire, after which it was not rebuilt. On March 29, 1998, the College's campus was hit by a mile-wide F3 tornado that broke 80 percent of the windows, leveled nearly 2,000 trees, toppled the chapel's spire, and caused more than $50 million in damages. This event is considered to be one of the most expensive college disasters in history. There was only one death (not a Gustavus Adolphus College student), despite the tornado's widespread path; this is most likely because most of the college's students were away on spring break at the time. Hundreds of volunteers worked to get the campus back into a condition where the students could return after a three-week hiatus. Still, students were forced to attend some classes in FEMA trailers as some on-campus buildings were too severely damaged. The majority of the college's 2,600 students (known as "Gusties") live in 14 residence halls on campus, in college-owned houses/apartments, and, a small minority, in theme areas, such as the Carlson International Center, CHOICE substance-free housing, and the Swedish House. Students with permission from the college may choose to live off-campus within the community of St. Peter or elsewhere. The college has an independently operated dining service, serving the Market Place cafeteria and Courtyard Cafe. The Princeton Review ranked Gustavus 8th in its "Best Campus Food" category for 2009. There are more than 120 special interest groups and organizations at Gustavus Adolphus College. Students are very engaged on campus. In 2015, Gustavus was designated by the Carnegie Foundation as a “community-engaged campus”—the highest national distinction available for higher education. Active student organization on campus have included Model United Nations, the National Forensics Debate team, the Gustavian Society of Filmmakers, to name a few. Students are encouraged to create their own clubs or teams and apply to Student Senate for funding. Nearly 1/5 of students are active in Greek life at Gustavus, where there are currently twelve recognized Greek organizations on campus. This includes several Greek organizations founded at Gustavus, including the largest sorority on campus, Delta Phi Omega, the Epsilon Pi Alpha fraternity, Tau Mu Tau sorority, and the Tau Psi Omega fraternity (also known as the Reds). Many musical ensembles perform throughout the year, including the Gustavus Choir, the Choir of Christ Chapel, the Lucia Singers, the Gustavus Adolphus Symphony Orchestra, Gustavus Wind Orchestra, Gustavus Jazz Lab Band, etc. Gustavus Adolphus College has a very active theatre program. Theater and Dance events are a vibrant part of "Gustie Life", with shows every fall and spring and a musical every other year. Students do not need to be a part of the theatre program to audition for the various plays held during the academic year. The Gustavus Dance Company and the Apprentice Company hold open auditions and perform a fully produced set of work. The college is also home to the social justice theatre troupe, I Am We Are. There are two art galleries on campus, the Hillstrom Museum of Art and the Schaefer Art Gallery. The college's study abroad program has included internships at BNU-HKBU United International College in Zhuhai, China. Gustavus is a founding member of the Minnesota Intercollegiate Athletic Conference, MIAC. Key sports at the college are tennis, swimming, golf, basketball, ice hockey, football, and soccer. The school's team name is the Golden Gusties, represented by a lion mascot because Gustavus Adolphus was known as "The Lion of the North." Gustavus has had three players drafted in the NFL Draft: Russ Buckley in 1940, Kurt Ploeger in 1985, and Ryan Hoag in 2003. On March 26, 2014, Gustavus announced it would not continue its men's and women's Nordic skiing team. This will go in to effect in the 2014-2015 school year. The Gustavus women's softball team placed third in the NCAA Division III national tournament in 2009. The Gustavus men's hockey team placed second in the NCAA Division III national tournament in 2009. The Gustavus soccer team finished second in the NCAA Division III national tournament in 2005 — led in part by three-time all American Robert "Bobby" Kroog. In 2003 the Gustavus men's basketball team finished second in the NCAA Division III national tournament. In the middle of the twentieth century, the Gustavus football team was coached by long-time coach/AD Moose Malmquist. In addition, the women's hockey team has won seven conference titles, including six straight, and has placed in the top four nationally in 2002, 2005, 2006 and 2010. The Gustavus men's tennis team have made 11 consecutive appearances at the NCAA Division III National Championships. Gustavus Adolphus College hosted the 2013 USTA/ITA Midwest Regional Championships at the Swanson Indoor Tennis Center and Brown Outdoor Courts in St. Peter, Minnesota. In 2003 Steve Wilkinson's squad placed third at the NCAA Division III Championships as well as a first-place finish at the ITA Indoor Championships. Steve Wilkinson retired in 2009 as the winningest coach in college tennis history with a record of 929-279. Gustavus player Eric Butorac, closed out his senior season of 2003 by winning both the NCAA Division III singles and doubles championships, with Kevin Whipple as his partner. In 2003, Eric Butorac turned pro. He is now a doubles specialist, and has achieved success being the no. 3 ranked American doubles player for the bulk of the past six years. A couple of women alumni who played ice hockey at Gustavus, have gone on to represent the United States at the 2016 Women's Bandy World Championship. Gustavus placed 8th in the 2008–09 Learfield Sports Directors' Cup standings. The Directors' Cup is the only all-sports competition in intercollegiate athletics. In Division III, standings are based on national tournament finishes in 18 sports. In 2002–03 Gustavus placed a school-best sixth in the Directors' Cup standings. "Come on you Gusties, Fight on, Fight on. Shout out the battle cry of victory. Come on you Gusties fight to the end, fight on for dear old G – A – C. Gusties fight on tonight, Gusties fight on tonight, Fight, Fight, Fight, Fight, Fight, Fight. Gusties fight on, Gusties fight on tonight. Gusties fight on. Beat ‘em, bust ‘em, that’s our custom, Gusties fight on!" The Gustavian Weekly, first published in 1920, is the campus newspaper. Its predecessor was the College Breezes. In addition, there were various other names for the student paper from June 1891 into 1902. Full-text digitized issues from 1920 through spring 2005 can be found through the Digital Collections page of the Gustavus Adolphus College Archives. Firethorne is an arts and literary magazine published twice per year. Students submit short stories, poetry, creative nonfiction, photography, visual art, or other creative content. KGSM is a webcast-only radio station operated entirely by students. The studio moved to the Beck Academic Hall in 2011 to improve the quality of its webstream and added a digital audio workstation. The newest campus media outlet is GAC TV. Started by a group of students interested in bringing television broadcasting to campus, GAC TV became an instant success when students started watching the weekly show before free on-campus films. The Gustavian yearbook publishes a yearbook for each class and dates back to 1920 with predecessor publications released under different names dating back to 1904. Digitized volumes from 1904 through 1992 have been made available on the Digital Collections page of the Gustavus Adolphus College Archives. Digitization of volumes from 1992 to the present is currently underway. TV broadcasts from Gustavus are released over Internet II. An alumni magazine, the Gustavus Quarterly, features articles of interest to graduates. David Esbjornson, theatre director, worked on debut plays by Arthur Miller, Edward Albee, and Tony Kushner (world premiere of Angels in America: Millennium Approaches). Artistic Director of Seattle Repertory Theatre. Peter Krause, American film and television actor, currently starring the NBC drama Parenthood. Magnus Ranstorp, internationally renowned expert on terrorism and counter-terrorism. Joyce Sutphen, American poet and Minnesota's Poet Laureate. ↑ "Marketing and Communication". Gustavus Adolphus College. ↑ Waldhauser, Steve (2011). "Songs of Thy Triumph – A Short History of Gustavus Adolphus College" (PDF). St. Peter, Minnesota: Gustavus Adolphus College. Retrieved September 26, 2011. ↑ "Gustavus Adolphus College". U.S. News & World Report. ↑ "2016 Best Value College Rankings | MONEY". Retrieved 2016-08-27. ↑ "MONEY's 2016-17 Best Colleges Rankings". Retrieved 2016-08-27. ↑ "College Guide Rankings 2015 – Liberal Arts Colleges". Washington Monthly. Retrieved 2016-08-27. ↑ Ap (1990-12-10). "RHODES SCHOLARS SELECTED FOR 1991". The New York Times. ISSN 0362-4331. Retrieved 2016-08-27. 1 2 3 4 “The Dedication of ‘Old Main’: the fiftieth anniversary.” Gustavus Adolphus College, 1926. Print. 1 2 “Dedication Ceremony: on the occasion of the renovation of the Old Main building.” Gustavus Adolphus College, 2005. Print. ↑ Freiert, William K. “Old Main Rededication Remarks.” Rededication of Old Main. Oct. 8, 2005. Print. ↑ "Christ Chapel". Gustavus Adolphus College. ↑ "Carnegie Selects Colleges and Universities for 2015 Community Engagement Classification - Carnegie Foundation for the Advancement of Teaching". Retrieved 2016-08-27. ↑ "UIC welcomes 20 international interns aboard". United International College. ↑ "NACDA.COM :: NACDA Official Web Site". 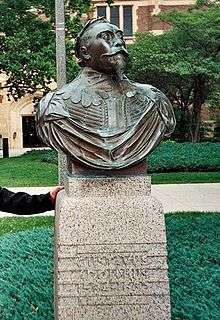 Wikimedia Commons has media related to Gustavus Adolphus College.